Just as animals require minerals and nutrients, plants also require minerals and nutrients for proper growth and fruit development and maturity. Soil type, pH, and drainage all play important roles in nutrient availability for vine uptake. The key elements in grape production are nitrogen (N), potassium (K), calcium (Ca), phosphorous (P), and magnesium (Mg) (Table 1). Table 1. Essential nutrients used by 3-year-old Concord vines measured in pounds/acre. The bulk of available nutrients comes from the soil itself, followed by any soil amendments, roots, leaf area, and supplemental fertilizers (Figure 1). Soil type will dictate the quantity of nutrients present, as well as the adequacy of water drainage, which, in turn, affects nutrient availability. Soil composition, such as soil pH (Figure 2), texture, and drainage, affects how readily available the nutrients are for root uptake. 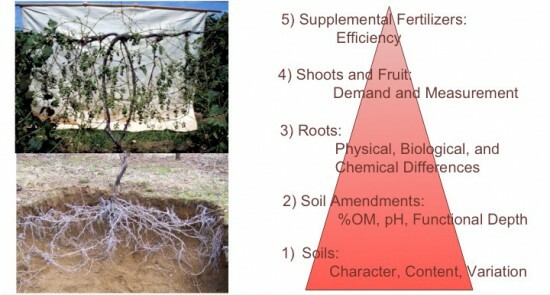 Root structure â€“ depth of rooting, microbial activity near roots, and root type (rootstock) â€“ plays an important role in nutrient uptake, as this is the first entry point for nutrients in the vine (Figure 3). Well-drained soils with little compaction will allow for adequate root growth and development, leading to optimal nutrient uptake. Balancing fruit and shoot demands with photosynthetic production will enable vines to be most efficient in nutrient use. Finally, supplemental fertilizers are used as a readily available resource for vine roots to maximize efficiency in short periods of time. Figure 1. Avoid breaks in the nutrient-flow system from the roots to the shoots and vice versa. Ensure the soils have adequate drainage (or water, depending on location) and maintain balanced vines. 1) Start with proper site selection, complete with well-drained soils with high organic matter. 2) Prior to planting adjust the soil nutrient composition with nutrient amendments. 3) Be sure to select a proper rootstock for your site. 4) Maintain vine balance between fruit and shoot ratios for optimal fruit quality and vine health. 5) Maintain nutrient levels through soil/petiole testing and supplementation with fertilizers. Figure 2. Soil pH is essential in vineyard nutrition management. Keeping soil pH within 6.0 and 6.5 maintains the highest levels of uptake by the vines of the majority of essential nutrients. Figure 3. Root structure. Different rootstocks can have different rooting patterns - some can be deep (left) or shallow (right). Monitoring soil and petiole nutrient content for the lifetime of a vineyard should become part of an annual (petiole) or every 3-5 year (soil) vineyard management program. While knowing soil composition is important in maintaining vine health, petiole testing will provide real-time nutrient levels within the vine. In other words, what is in the soil may not necessarily make it into the plant, and vine nutrient levels vary greatly year-to-year and even within a season, while soil nutrient composition usually changes over several years. Most extension and research programs recommend that petiole testing be done at about 70-100 days after bloom; this is the time during which nutrient analysis laboratories can get the most accurate reading on the largest number of nutrients. Petiole testing around bloom is recommended if nitrogen levels appear to be a problem. Soil sampling and testing can be done at any time during the year, as long as the soil sent in is dry - the save on shipping costs and to enable more accurate results - and the majority of nutrient analysis laboratories require the soil type to be identified for each sample, so soil maps need to be at the ready when sampling! Table 2. Soil and petiole nutrient composition requirements. Keep vine levels within these ranges for optimal fruit quality and vine health. Wolf, T. et.al. 2008. Wine Grape Production Guide for Eastern North America. Cooperative Extension NRAES:145.